XSEED Games, the independent-minded publishing brand of Marvelous USA, Inc., today returned to the stage to announce the release of the free “Bonus Tracks Vol. 1” DLC for Gal Metal, the Nintendo Switch-exclusive free-form rhythm title from developer DMM GAMES. 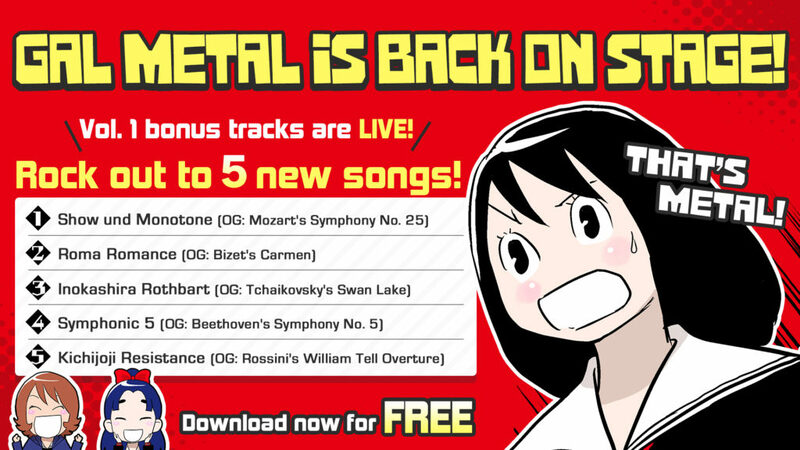 Starting today, Gal Metal owners can download five free tracks – Show und Monotone, Roma Romance, Inokashira Rothbart, Symphonic 5, and Kichijoji Resistance. These songs are available on Nintendo eShop as separate downloads for the digital version of Gal Metal and the physical “World Tour Edition”. Owners of the physical version of the game can download the DLC by searching “Gal Metal World Tour Edition” on Nintendo eShop or from the Nintendo product page for Gal Metal World Tour Edition. The show isn’t over though, as there’s one more encore performance coming to Gal Metal. Publisher XSEED Games will be releasing an additional set of five free DLC songs at a later date, so keep those drum sticks at the ready! Gal Metal is a rhythm game designed for Nintendo Switch that turns the Joy-Con into drum sticks. Players will take hold of the Joy-Con and rock along with the music in order to repel would-be alien conquerors. This is accomplished by creating complex performances and racking up millions of points using personal free-form drumlines based on over a dozen different beats. With Nintendo Switch™ Pro Controller support on offer as well, players will be able to choose how they want to jam and earn metal power to use against these nefarious invaders in this uniquely adlib-friendly rhythm experience. Gal Metal is available digitally and at retail exclusively for Nintendo Switch in North America.